University home > Services > Library > ad-lib > Man Booker Prize 2016 – It’s a Sellout! Man Booker Prize 2016 – It’s a Sellout! 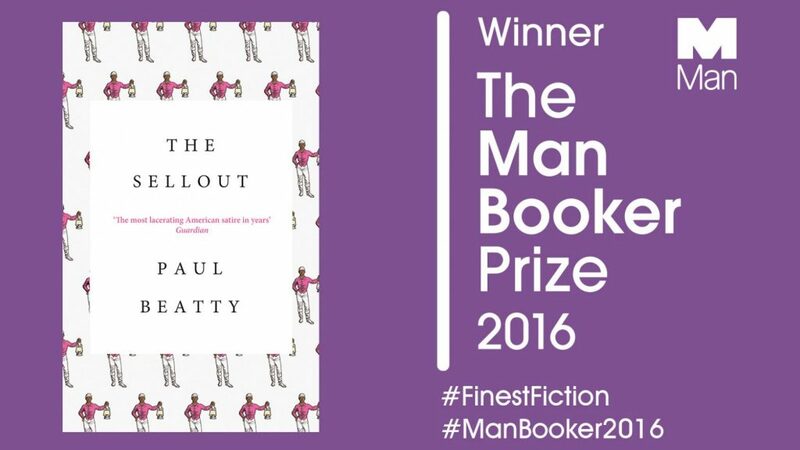 Congratulations to novelist Paul Beatty, who became the first American writer in 48 years of competition to win the prestigious Man Booker Prize for his novel The Sellout. The Sellout has been described as a topical satire on race relations in contemporary America as seen through the eyes of an African-American man living in a run-down fictional American town in the process of being torn apart by increasingly rising racial tensions. Paul Beatty is the first American author to win the £50,000 prize after US authors became eligible in 2014. The 2016 shortlist included two British, two US, one Canadian and one British-Canadian writer. We will shortly be adding The Sellout to our stock, but in the mean time you can find and read previous Man Booker Prize winning and nominated novels upstairs among our Leisure Reading collection on Level 4. Today is National Poetry Day, a nationwide celebration of poetry for everyone, everywhere, which falls every year on the first Thursday of October. Since it was first launched in 1994, the day has been marked by a nationwide celebration of all things poetic. From 1999 onwards, National Poetry Day has been loosely “themed” – the theme is not prescriptive but it serves to kick start inspiration. This year’s theme is ‘Messages’, with the aim of encouraging people to literally “say it with a poem”! Thanks to our own English & Drama School, we’ve built up quite an extensive range of poetry, ancient and modern, ranging from the Greek epic poetry of Homer to Shakespeare’s Sonnets, to the 19th century classics of Coleridge and William Wordsworth, to the contemporary poetry of Philip Larkin and Andrew Motion. Not forgetting our comprehensive range of literature databases available on Library Catalogue Plus, most notably Literature Online (LION), from which you can glean everything you ever wanted to know about your favourite poem or poem. Why not have a browse? Have you ever wondered what books looked like in antiquity? Perhaps you have pondered why some manuscripts are written on paper and some on parchment? Did you know that the ancient Greeks thought up machines and robots powered by steam? These issues and more are taken up on a new web resource launched by the British Library today dedicated to the study of Greek written heritage, Greek Manuscripts. Intended to complement and promote the hundreds of Greek manuscripts digitised by the British Library in recent years, the website contains articles on a wide variety of subjects relating to Greek papyri and manuscripts, written by experts from the UK, continental Europe, and North America. 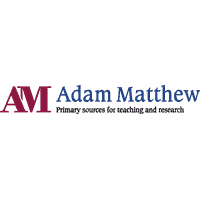 Additionally, several videos provide short visual introductions to key topics. Collection items discussed in the articles are given separate item pages, with links to the online catalogue entry and full digital coverage on Digitised Manuscripts. 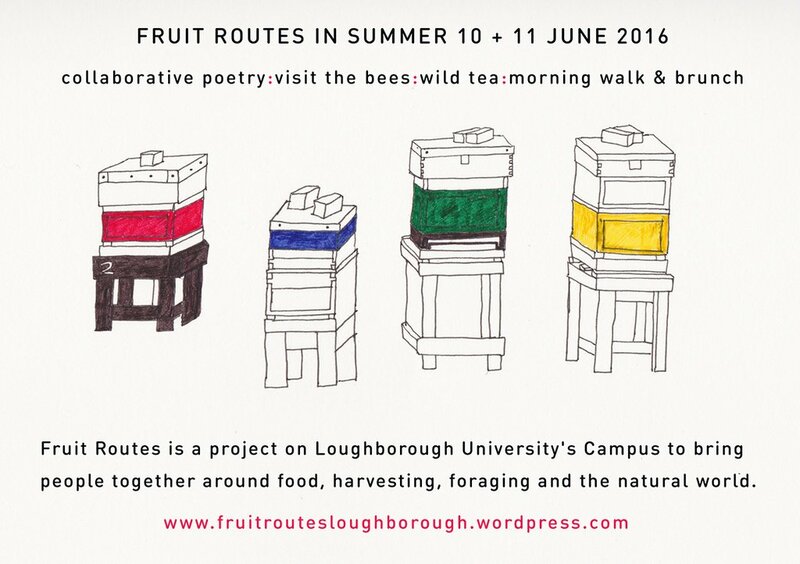 Fruit Routes, the University’s artist-led project designed to bring people together on Campus around themes of food, foraging and the natural world, are delighted to be hosting their first Renga on the campus on Friday 10th June. Renga is a 1000 year old Japanese form of collaborative non-narrative poetry made up of a series of short linked verses. The process of writing a renga is a shared creative experience open to all. The renga welcomes absolute beginners (age 8 +) as well as experienced writers. Renga is a frame that binds people, landscape and seasons. It is led by a master poet, who holds the map, and a host poet. Joining the Fruit Routes renga will be local artist, cultural forager and poet Little Onion (Paul Conneally) and Kerry Featherstone (Lecturer in Creative Writing, Loughborough University). Over the four hours of the event participants will experience the rhythm of writing, reading, listening, the silence and sound that is renga – and tea!. Don’t Be Reluctant – Join Our Club! 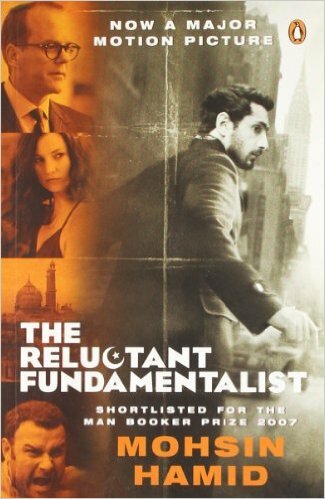 The Student Book Club meets for the last time this academic year when we will be discussing Mohsin Hamid’s highly acclaimed The Reluctant Fundamentalist. Published in 2007 and set against the background of the aftermath of the September 11 Attacks, the novel tells the story of a seemingly chance meeting between two strangers in a busy Lahore street – yet neither man is quite what they seem. Adapted for the silver screen in 2012, the book was short-listed for the 2007 Booker Prize, and named by the Guardian newspaper as one of the books of the decade. 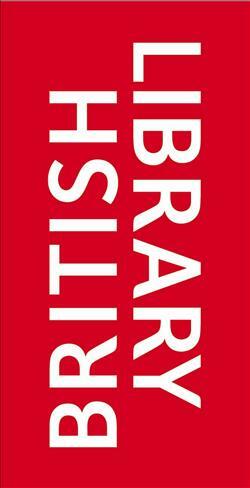 The Book Club will be meeting up to discuss the book in the Library Staff Room on Monday 16th May at 7pm. Copies of the book are still available to borrow ahead of the meeting – just ask for a copy at the Level 3 Enquiry Desk. Where There’s A Will, There’s A Website! 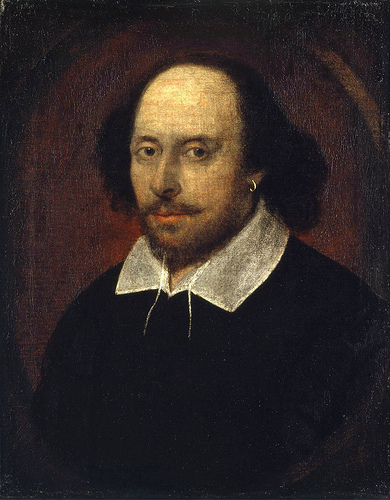 To mark the 400th anniversary of the death of William Shakespeare two brand new electronic resources have been launched by the BBC and Oxford University Press. The BBC Shakespeare Archive Resource contains a wealth of Shakespeare material, including all of his plays, poems and sonnets, documentaries, interviews and over a thousand stills of classic Shakespeare productions, as well as entertainment programmes referencing Shakespeare. Oxford University Press’s Illuminating Shakespeare provides access to Shakespeare resources from the wealth of material published by OUP and explores a new theme every month with specially commissioned videos, articles, and interactive content. Don’t forget as well that the British Library last week launched their own anniversary exhibition, Shakespeare in Ten Acts. William Shakespeare portrait copyright Books18, reproduced under CC License from Flickr. This week the British Library is inviting people to join them on a journey through 400 years of history – from the first productions of Hamlet and The Tempest – to understand how Shakespeare’s plays have been transformed for new generations of theatre-goers. Shakespeare in Ten Acts showcases over 200 unique and rare items such as the only surviving play-script in Shakespeare’s hand, an authentic Shakespeare signature, the earliest printed edition of Hamlet from 1603 and Shakespeare’s First Folio. Complementing the exhibition is a new online learning resource, Discovering Literature: Shakespeare. Whether you’re a student, teacher, researcher, or simply a lover of literature, Discovering Literature: Shakespeare will encourage critical thinking and independent learning to enrich your understanding of all-things Shakespeare. In memory of Professor Bill Overton (1946-2012), the School of the Arts, English and Drama offers this prize for a sequence of poems on any subject, up to 300 lines, which will be judged by the University’s own poet in residence, Helen Calcutt. 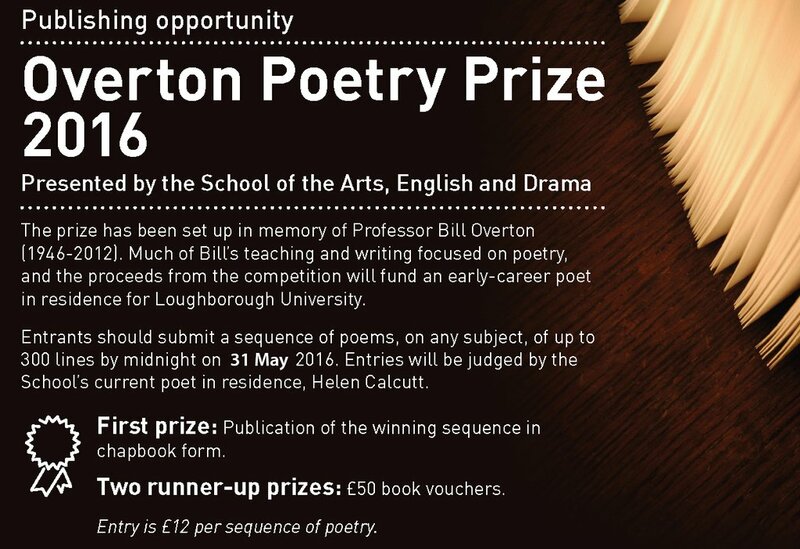 Much of Professor Overton’s teaching and writing was on poetry, and the proceeds from this competition will fund an early-career poet in residence for Loughborough University. 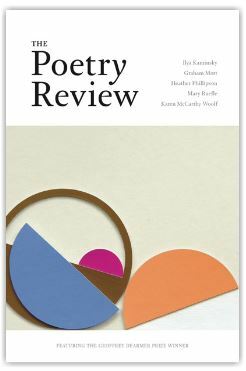 It is hoped that this poetry prize, set up in Professor Overton’s memory, will contribute to the creative life of the School, and the experience of its students. Hard copy entries must be accompanied by a cheque to: Overton Poetry Prize, FAO: Roxy Winterborne, NN0009, School of the Arts, English and Drama, Martin Hall, Loughborough University, Loughborough, Leicestershire, LE11 3TU. Closing date for the competition is Tuesday 31st May 2016.